Margherita d’Ayala Valva has held two lectures within the course of Flavio Fergonzi on national identity issues in twentieth-century Italian art. She has approached the topics of painting techniques focusing on its international context: the market of industrially produced colours and the circulation of manuals and treatises among artists. 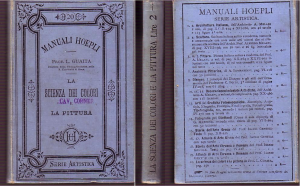 Nevertheless, the lectures have also showed some peculiarities of the Italian context, through the presentation of some case studies (the research on Vittore Grubicy’s sources, works and materials and the current investigation on the documents on the Muzii colours from the Lefranc archives).